I'm not sure if lines 6 - 7 & 8 - 11 are being done correctly. I feel like it's necessary to prove 12 which proves the rest of the problem. I'm a bit stuck on lines 8 - 11. I initially tried to do it straight up. I couldn't see what I was doing wrong so I tried adding in sub-proofs but that complicated everything. Anyone have any hints on where to go next with this? You have to use or-elim on 1) considering two separate cases. 1st case : Dodec(x) and Large(x), from which, with 3) and assuming Small(x), derive a contradiction and then FrontOf(x,c). 2nd case Cube(x) and Small(x), from which, with 2), derive FrontOf(x,c). 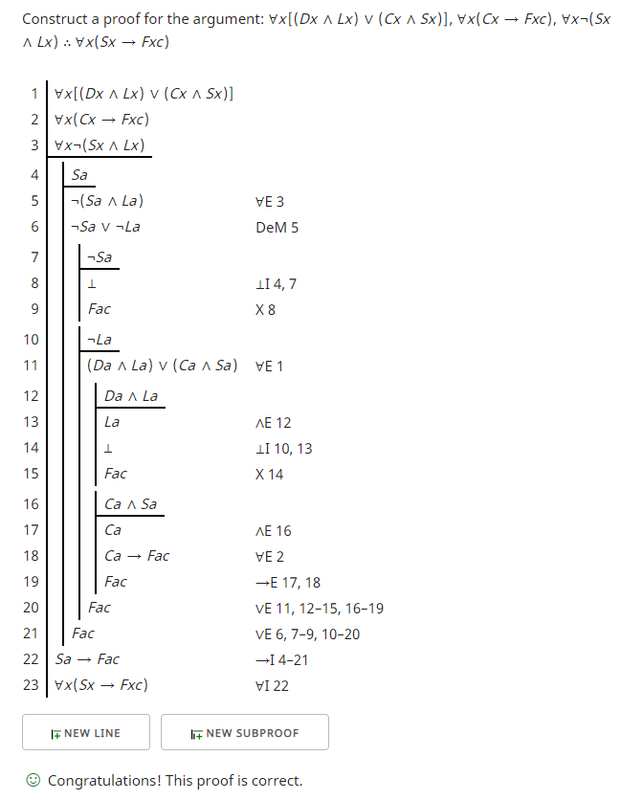 The form of 'v elimination' is a Proof by Cases. You raise two subproofs, by assuming the cases of a given disjunction in turn, with the goal in each to derive the same conclusion. 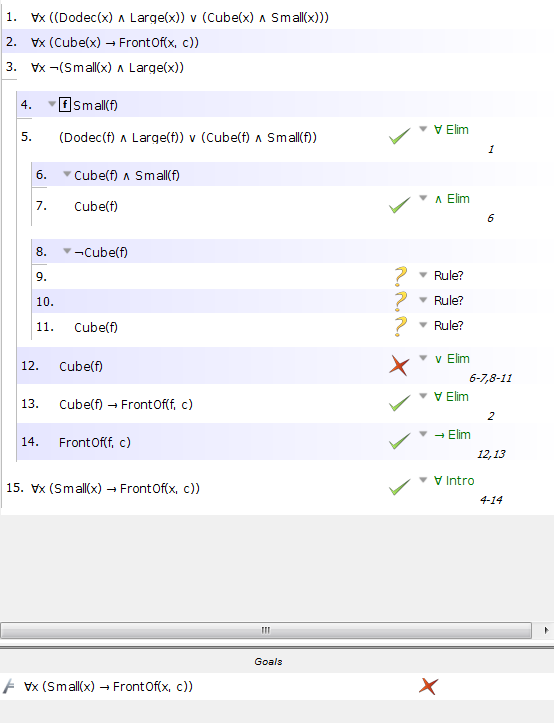 Here's roughly how to get from your Small(f) assumption (line 4) to Cube(f). Dodec(x) is replaced with Dx. Large(x) is replaced with Lx. Cube(x) is replaced with Cx. Small(x) is replaced with Sx. FrontOf(xc) is replaced with Fxc.